CAS-Hire are glad to announce the new additions to our squad of specialist dryers, that we managed to get signed up before the end of the January transfer window. The CTR150 Combi will hopefully manage to make a significant impact for the rest of the winter season and hopefully become a regular high achiever in our Specialist Drying equipment category. 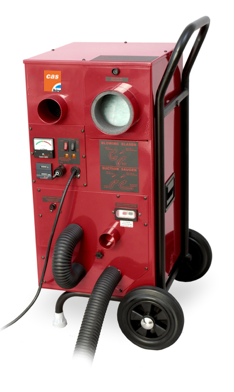 This high performance portable metal cased dehumidifier incorporates a specially designed drying system including in-built powerful air turbine. This high performance dehumidifier produces highly effective extraction results whilst producing a particularly low noise performance level. CTR K150XT combi dehumidifier can be hired for drying out layered constructions up to 40 m², subject to material. The CTR150XT includes an integrated flow meter which monitors and displays the airflow through the machine. This incorporated with the C16 hose system kit allows for the dry warm air to be injected specifically into the heart of the damp effected area to speed up the drying process. The heavy duty robust unit is mounted on a steel tubular frame with heavy duty castors for easy manoeuvrability. This model can be generally used to target insulated wall and floor cavities subject to materials however can also be utilized for drying layered constructions up to 40 m² (mineral wool) or up to 30 m² (foam). During suction drying process there maybe releasable water and the turbine must be used in combination with the 3-Stage Filter system for water separation. This ingenious little player is credited with being a clear quality performer when used to assist dry out floors and wall surfaces. The DM Boost Box has been designed and produced to support the D2 Heat Dryer in colder weather conditions. The strongly constructed roto-moulded plastic housed DM Boost Box now offered for hire from CAS-Hire provides an supplementary 2kW of thermal heat to the affected area being dried out. DM Boost Boxes can be used alongside any standard Carpet Dryer fan / air mover linked directly to DM Wall and Floor drying mats offering a wide variety of drying option solutions. When using the stylish machinery integrated with the design of the D2 Heat Dryer, the DM Boost Box allows the hirer the choice to observe the affected area being treated via a wired sensor system. The uninterrupted monitoring facility of the affected area being treated allows the DM Boost Box to automatically modify the output to suit the changing conditions and increase or reduce its power consumption accordingly. The hirer or drying technician can set a precise drying level and the DM Boost Box will make sure the material being dried out until you have reached your desired drying level. The DM Boost Box can also directly control the power supply to a standard carpet dryer air mover. Once the desired drying level is achieved the DM Boost Box will power down both itself and the Carpet dryer making a more economic efficient drying system. The DM Boost Box can also be used in combination with the D2 Heat Dryer in intense climate environments. By managing an increased air temperature within the affected room hugely improves the amount of moisture evaporation thus reducing drying times and costs. The DM Boost Box has been designed to provide drying technicians a machine that can work alongside existing moisture damage restoration equipment which will enhance the drying performance. The DM Boost Box detects the humidity and temperature of your air flow within the affected area being treated by continuously monitoring and cleverly controlling its own output to steadily maintain your drying environment efficiently. Hire your specialist drying equipment today! Please contact us on freephone 0800 525082 or email info@cas-hire.co.uk for further details. Dehumidifier to the rescue after pipe leak!